Drug cartels build elaborate tunnels, some with rail tracks and lighting, under the Mexican border to smuggle drugs into the U.S. 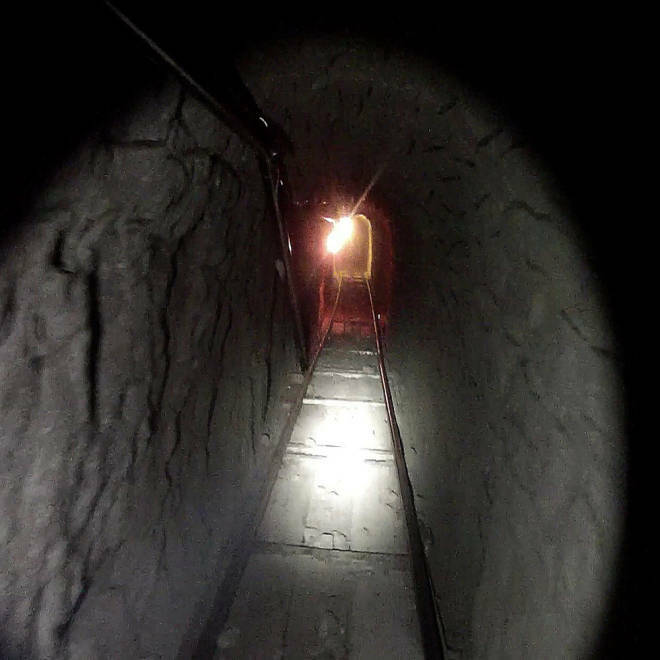 Authorities have discovered a new and “highly sophisticated” drug tunnel, complete with rail tracks, ventilation and lighting, under the border between San Diego and Mexico, and seized more than eight tons of marijuana and 325 pounds of cocaine. The San Diego Tunnel Task Force, which includes members of ICE, the DEA and Customs and Border Protection, found the tunnel on Wednesday, just south of the Otay Mesa border crossing in Tijuana, Mexico. Authorities said that the tunnel, which linked two warehouses, was found before it was used, and three people were arrested. Authorities said at a news conference Thursday afternoon that the so-called "supertunnel" zig-zagged for about a third of a mile at an average depth of 35 feet. The discovery of cocaine marked the first time the drug was found in a San Diego-area border tunnel. Nearly four dozen tunnels have been discovered under the Mexican border over the past five years. Most are used to smuggle drugs into the U.S. While some are crude holes in the grounds, others have had lighting, ventilation and even elevators. Tunnels are common in the San Diego area, where there are many warehouses close to the border. Many are financed by drug cartels. Tunnels often run from a camouflaged hole in the floor of one warehouse to another warehouse on the other side of the border, though they have also been found in private homes. 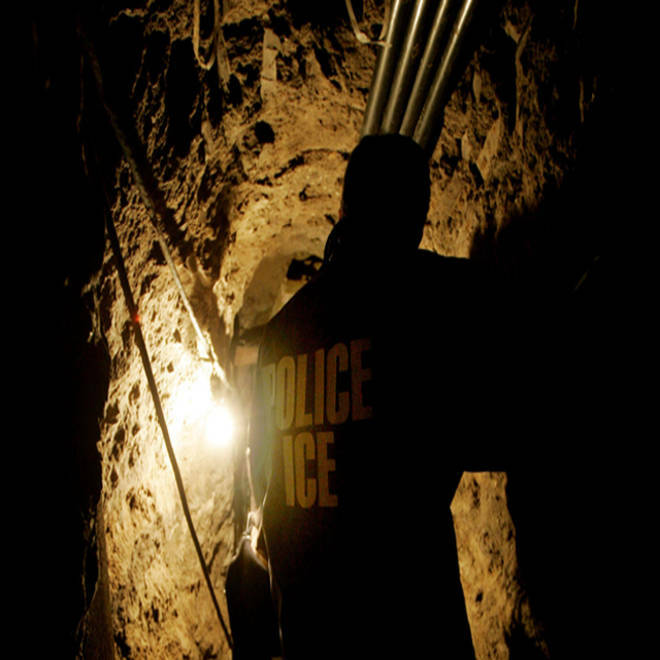 U.S. and Mexican authorities have uncovered a "highly sophisticated" tunnel used to smuggle drugs beneath their common border, officials said Thursday. The tunnel was shut down Wednesday night after being discovered under the border between San Diego and Tijuana, just over the border in Mexico. The tunnel uncovered Wednesday night, which emerged near Tijuana’s airport 100 yards south of the U.S. border, was near the location of a similar sophisticated tunnel discovered two years ago. Video released by ICE showed officers entering a large warehouse in the Otay Mesa section of San Diego, then crawling into a hole cut in a concrete floor. Rail tracks are seen in the narrow tunnel below, and authorities said it also had lighting and ventilation. The video shows agents pulling bales of drugs from a lower hole and handing it into the tunnel, then up into the warehouse. U.S. Attorney Laura Duffy noted at Thursday's news conference that the tunnel cost drug traffickers "years and tens of millions of dollars" to build, but it was closed down before it could be used. “They did not move one gram of narcotics through that tunnel,” said Bill Sherman, DEA special agent in charge. At a news conference Thursday afternoon, Derek Benner, ICE special agent in charge, had a message for the smuggling ring, NBCSanDiego.com reported. "We are by no means finished here," Benner said. "Don't say we didn't warn you."